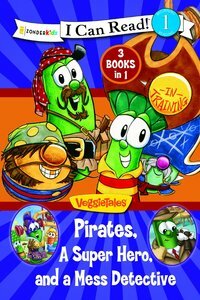 In this 3 in 1 bind-up of VeggieTales I Can Reads, Junior learns that even pirates have to go to school, the town of Bumblyburg takes an angry mud bath, and Larry forgets to listen ... again! Young readers follow their favorite Veggie friends in easy-to-read stories that help teach early reading skills as well as sound morals and Bible-based life lessons. Books included in this title include: Pirate in Training LarryBoy and the Mudslingers Listen Up, Larry Common Core Standards: CCSS.ELA-Literacy.RL.K.1 With prompting and support, ask and answer questions about key details in a text. CCSS.ELA-Literacy.RL.K.2 With prompting and support, retell familiar stories, including key details. CCSS.ELA-Literacy.RL.K.3 With prompting and support, identify characters, settings, and major events in a story. About "Pirates, a Super Hero and a Mess Detective (I Can Read!1/veggietales Series)"
Karen Poth is the director of design at Big Idea Productions. Prior to coming to Big Idea, she worked for the Disney Design Group in Orlando, FL. She holds a master's degree in Journalism from the University of Missouri. She lives with her husband in Chicago, IL. This series of Veggie Tale I Can Read books at Level One are sure to become favorites of young emergent readers and their parents and teachers. Using the beloved characters of Bob and Larry as well as their other Veggie friends, young readers will learn strong morals and values as well as be charmed by the humor and accessibility of the brand.